The charm and beauty of Christmas in Vienna and Prague is something I urge every avid traveler to experience. 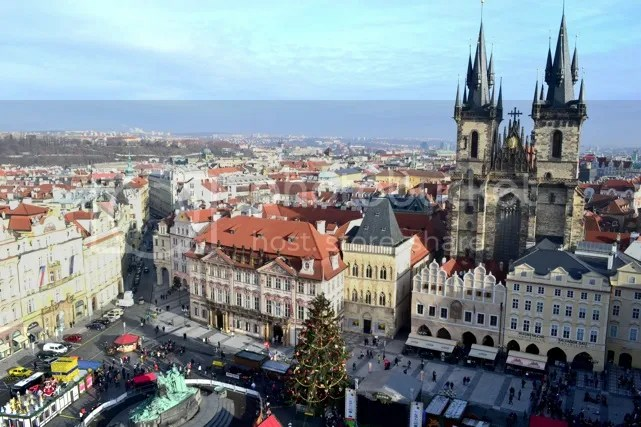 The scale upon which these two beautiful Eastern European cities celebrate the holiday season makes them well worth the visit, regardless of religious affiliation. Christmas markets are arranged throughout the main city squares where people line up to drink mugs full of steaming spiced wine, eat sugary confections, and buy a variety of holiday mementos to prepare themselves for the winter season. The streets are ornamented with thousands of lights that make evening strolls extraordinarily festive. And the cold weather brings lovers arm in arm and families bundled up together. As I, the over eager tourist, was lucky enough to be amidst all this holiday cheer, one thing became strikingly apparent: we all hold on to tradition. The winter holiday season holds different significance for each person as customs vary by religion, culture and nation. Despite this, all of them involve a commonality that helps mold and define these seasonal celebrations to their true shape: tradition. The end of the year marks a time for change and the hope for progress. However, it seems that no matter where we come from, what we believe in, or what language we speak, we all cling to some tradition as a means of security and warmth—something that makes even the coldest winter nights delightful and merry. Below are some of my favorite moments captured during my winter wonderland adventure—giving a small glimpse of the holiday season in Vienna and Prague. They do, in my eyes however, evoke the spirit of these beautiful cities transformed for the winter and the end of the year celebrations; a spirit of tradition that I was fortunate enough to observe and enjoy. St. Stephen’s Cathedral is emblematic of Vienna. It is the seat of the archbishop and one of the main tourist attractions of the city. Although damaged by fire due to WWII, this beautiful Cathedral holds great religious, cultural and artistic significance. The mosaic tile roof is a distinguishing and unique part of this church. A building with a powerful presence, the cathedral truly embodies the heart and soul of the city. As you go inside St. Stephen’s, you are given a whole different perspective. 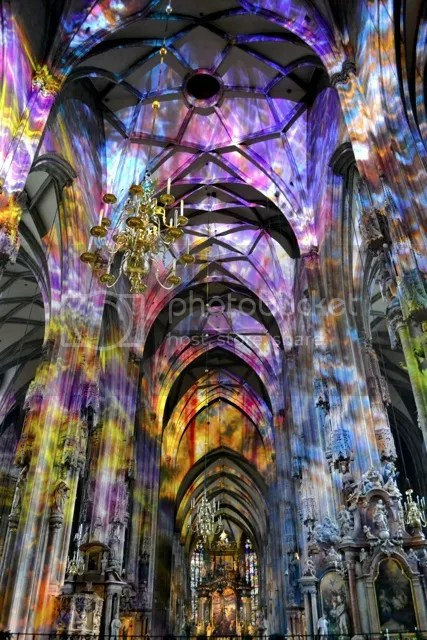 I am not sure if the colorful lighting was a seasonal or year-round decoration, but it was indeed like walking through a giant kaleidoscope as the colors dance vibrantly on the cold, grey walls of the cathedral. Hundreds of locals and tourists alike lined up in the cold at midnight Christmas Eve to attend mass for a distinctly beautiful ceremony. One of two main squares in the city, Old Town square, or Staroměstské náměstí, exudes historical beauty and dates back to the 12th century. This is a just a slice of the incredible 360º view from the Astronomical Clock tower. Shown is the Tyn Church and part of the Christmas market down below. An enormous tree, numerous food shacks and a concert stage fill the square during this time of the year. The roof structures on this church, known as spires, can be seen jutting out into the sky all over Prague. 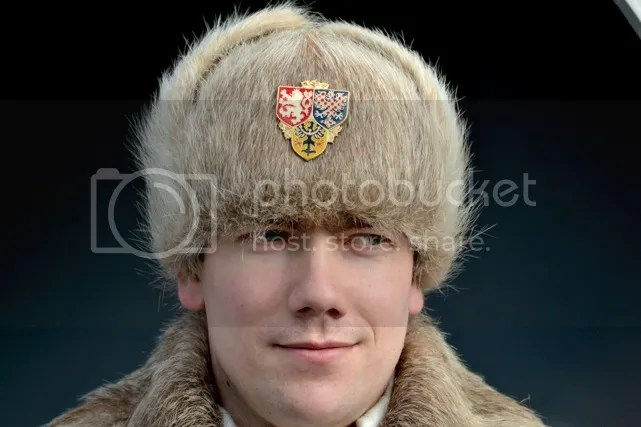 An observant guard at the Prague Castle can be seen wearing a ceremonial winter dress uniform. Said to be the largest castle in the world, the Prague Castle has rich political history, as leadership over the nation was transferred multiple times, including from the Kingdom of Bohemia, to the Habsburgs and finally to the current Republic. The establishment of the Republic in the early 20th century led to the creation of the castle’s guard force. 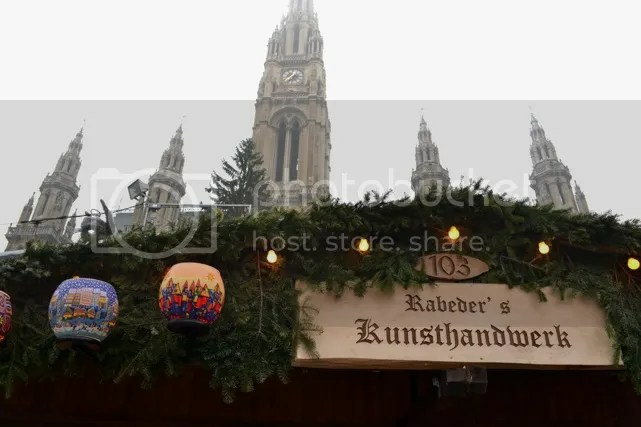 The largest and most popular Christmas market in Vienna is the one stationed in front of Rathaus, the city hall. Excited crowds of locals and tourists come to enjoy a stroll through markets—like this one—to enjoy music, food and good company. Popular food items include puncshe (hot spiced alcoholic drink), maroni (roasted chestnuts) and bratwurst (sausage hot dogs). Other items to be sold include souvenirs, clothing, Christmas decorations and crafts—like the lanterns shown in this picture. Perhaps the most affordable and easiest way to experience the holiday spirit was to just be outside. 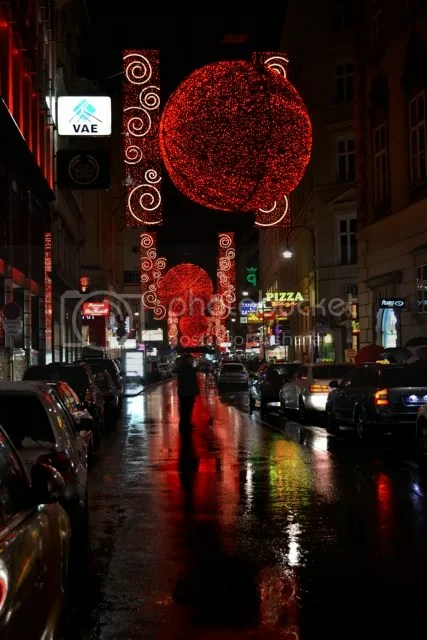 Every street, in Prague as well, had some sort of decoration—be it lights, wreaths or tinsel. The chilly weather did not prevent anyone from enjoying a nice stroll through the illuminated city streets, reminding me of my childhood neighborhood during the holidays. One of my favorite shots of the decorations shows the huge red spheres hanging in one of the streets leading to St. Stephen’s Cathedral. Kind of looks like some sort of life-size Pacman game, no? The Christmas markets of Prague would delight any and all of your senses, but the smell of a warm, sweet pastry could not go unnoticed. 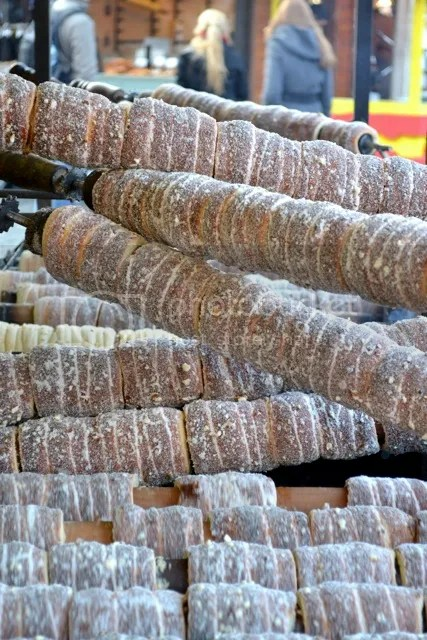 Trdelnik is like the Czech’s version of Cinnabon, with half the guilt and all the satisfaction. Dough is wrapped around a large metal spool, which is then cooked and toasted on an open-flame rotisserie. Once ready, the spool is removed and rolled around in a coating of cinnamon, sugar and crushed almonds. 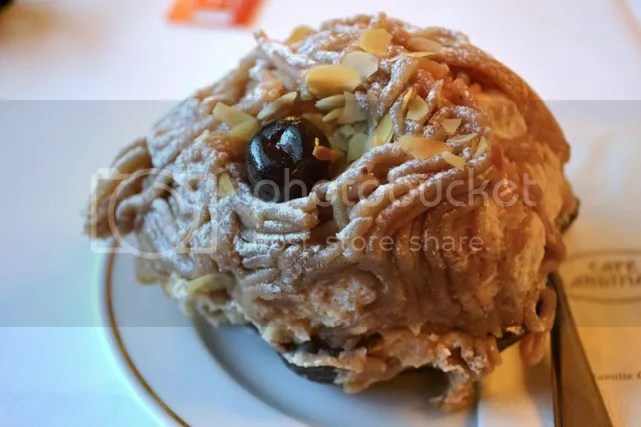 The pastry is then removed from the spool, leaving a hollow, cup-shaped, portable, pull apart, must-have-over-and-over-again confection. There is something about the wintertime that brings people together—be it the climate or the endless holiday celebrations. 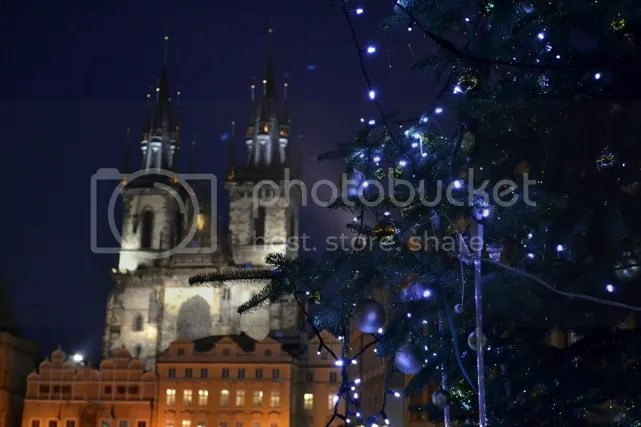 Prague emulates the romance of many other European cities, with cobblestone streets illuminated by iron lanterns ¬— adorned with picturesque statues. Walking along the oldest and most visited bridge in the city, the Charles Bridge, at sunset confirmed this fact. Upon the railings I saw these locks, engraved or marked with the initials of a pair of lovers. 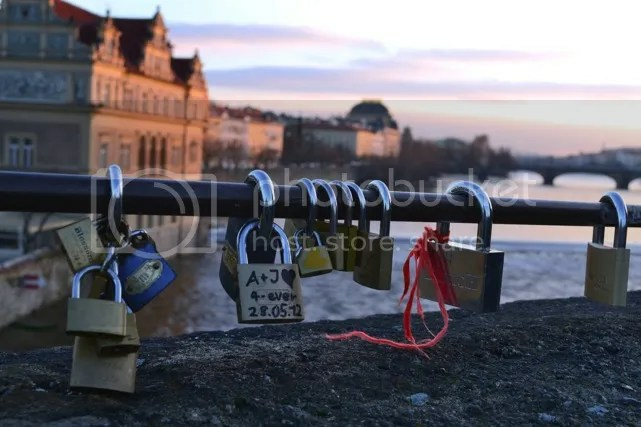 Not as impressive as the Bridge of Love in Serbia or the Pont des Arts in Paris, perhaps—but definitely something that warms your heart. Vienna, as the birthplace of such celebrated composers as Beethoven, Mozart and Strauss, is a historical and cultural hub for classical music. 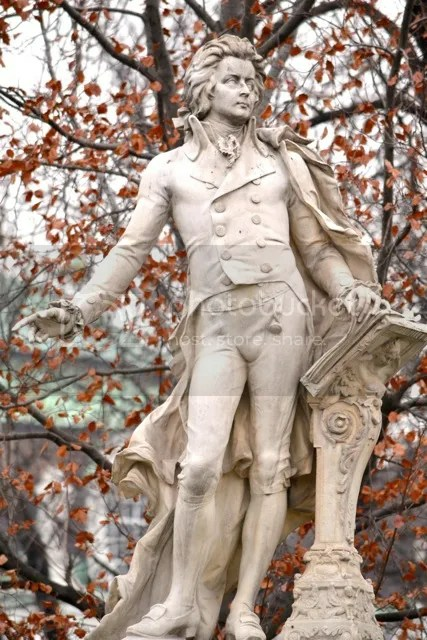 Concert halls, plazas and statues all pay homage to the various musicians and composers that lived in the city, like this famous statue of Mozart residing in Burggarten. Classical music’s influence on the nation can be noticed anywhere from local bakeries—in the form of a delicious layered cake called Mozart torte—to souvenir shops selling music note mugs or Austrian Airways playing Beethoven’s 5th Symphony before take-off. In my experiences abroad, I have learned one thing about sightseeing: everything you visit in the day, you also have to see at night. The Tyn Church, especially in its Christmas splendor, was magical after the sun set . 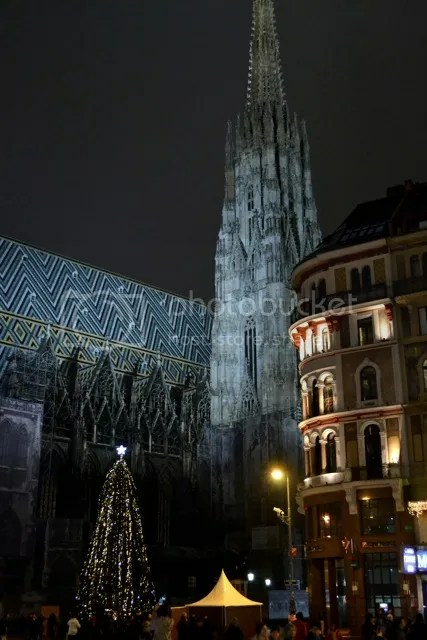 Upon seeing the church at night, my family noted, “It is like Disneyland… but real.” A gothic church with incredible presence stands as one of the main edifices in the Old Town Square. An interesting fact about the church: it houses the oldest pipe organ in the city. 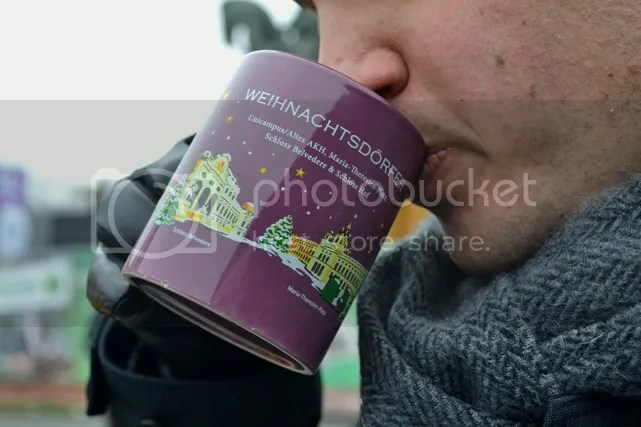 My brother just could not get enough of glühwein, a traditional Christmas mulled wine at the Viennese Christmas markets. Red wine heated and flavored with cinnamon, ginger and other spices fills the air with a soulful aroma. And the vendors even let you keep the mug! The mug here shows a drawing of this particular market: Weinachtsdörfer at the Maria Theresa Square, which is situated between Kunsthistorisches Museum and the Museum of Natural History. Chestnuts (maroni) are not just for roasting on an open fire. Served in a chocolate waffle cone bowl, this decadent dessert comprises a fluffy chestnut cream and a marzipan-like topping. We ordered this traditional, seasonal dessert at the elegant and popular Café Landtmann. Accompanying maroniblüte with a cup of milchkaffe, a café latte equivalent, makes this is the perfect holiday treat. Famous guests like Hillary Clinton and Paul McCartney have been known to visit Café Landtmann for their scrumptious pastries. As a first generation American, I catch myself struggling to maintain the traditions my family taught me. But with this trip, I learned that a tradition is just as adaptable as it is strong. Traditions can indeed exist in a modern setting. We don’t have to push away ideals or experiences that don’t strictly adhere to tradition. Instead, modern ideals and experiences can modify the tradition to make it more appropriate to its present application. In my travels through Vienna and Prague, I observed historical and cultural traditions flourishing in the modernity of my world. Rather than tainting these traditions, the modern setting appeared to only enhance their special value. Walking in the cold, indulging in sweets, and enjoying time with family are traditions I anticipate for the end of the year. But wandering through Christkindlmarkt Rathausplatz, taking a sugary trdelnik to-go, and documenting my family in beautiful a Eastern European backdrop are adventures that made this holiday season even more special. What is better than traveling the world? Writing about it.